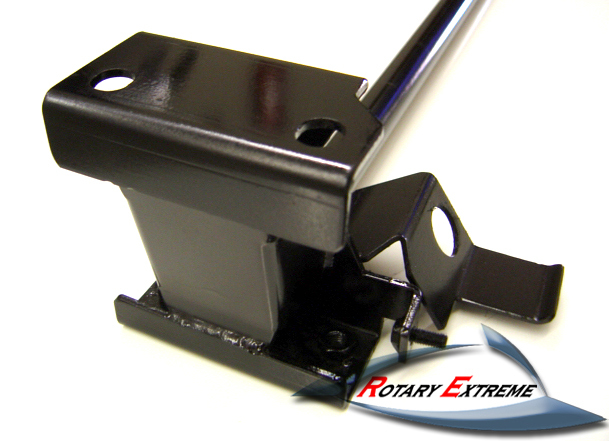 This group buy is for the Rotary Extreme Sway Bar Mount. From the 3rd gens we have worked on, 5 out of 10 have bent sway bar mounts. This is your good chance to get a heavy duty one for good prices. The stock sway bar mounts are known to be deformed or even cracked after years of use. The deformed sway bar mounts affect the handling of your car severely. Our heavy duty sway bar mount assembly is made of 1/8" thick carbon steel with a connecting center bar that further strengthens the rigidity. Our sway bar mount assembly will optimize the front suspension performance to give you that great handling characteristic that the 3rd Gen RX-7 is supposed to have. This is a must have if you are serious about the handling of your 3rd Gen RX-7. The assembly is designed to accommodate both the stock sway bar as well as virtually all aftermarket sway bars being offered. Shipping will be between $15-20 within the lower 48 States. To Join: $100 non-refundable deposit. whats the purpose of the bar from between the mounts? ive seen other aftermarket sway bar mounts with out it. just makes it a lil more rigid. He should add 2 tabs that connect it to the engine subframe like the RB brace does... Other than that, this looks to be a very good upgrade and one that ANYONE driving an FD hard should consider. Would the tabs holding upright radiators (Greddy FMIC) be strong enough to hold overtime? I assume I would have to modify this for my setup? That's the extra reinforcement we throw on there without charging you more. [quote name='treceb' date='Apr 6 2005, 08:31 AM']whats the purpose of the bar from between the mounts? ive seen other aftermarket sway bar mounts with out it. They are defintely strong enough to hold any radiator. You will need to modify it just like you modify the stock sway bar mounts to work with the Greddy FMIC. I will post photos sometime next week. I will paint one in a lighter color such as red or white so you can see better on how it mounts on the car. The regular color will be black. [quote name='FikseRxSeven' date='Apr 7 2005, 07:17 AM']any installed pics? im in. gonna buy 1 or 2 more items, ill let you know for sure next week and ill send deposit/payment then.